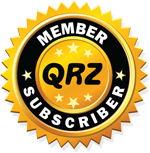 Hi I'm Carl MW0TBB, I in live North Wales, I also hold an ARRL American technician class license hence KC2ZIL. Short wave listening to my local repeater GB3CR was the inspiration for me to get my radio amateur license. I don't get much of a chance to rag chew in the mornings or evenings as I prefer to keep my mind on driving, especially when on the A55/M53/M56 but once in a while I will chime in if I have something to say. It has to be said that GB3CR is very active during the morning and evening net’s, the good natured banter from the local and not so local amateurs making it into the box is very entertaining and often brings a wry smile to my face. Anyway this web site is basically a diary of my interest and hopefully it may give you an insight into the hobby and may even inspire some newcomers to take the plunge. At home I spend a lot of time on the HF bands and I particularly enjoy the data modes such as PSK31 and more recently JT65 & Wspr. I plan to get a bit of QRP/P operating done with my portable rig & I will be trying a bit of data mode in the field, that is when the opportunity and dry weather permits. So get yourself a cup of your favourite brew, sit back and take a bit of time to have a look around my web site.